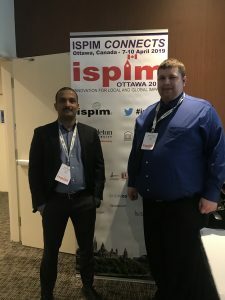 Dr. Jon Thomas and his student research assistant, Jordan Evans (UFV CIS), presented research papers on “University Entrepreneurship” and “Innovation in the Fraser Valley”, at the ISPIM Connects Conference in Ottawa earlier this month, April 2019. ISPIM is the International Society for Professional Innovation Management formed in Norway in 1983 with members in over 70 countries, and ISPIM Connects Ottawa is an international peer-reviewed conference attracting leading innovation researchers and practitioners from across the world. The event was particularly notable for Jordan as it was his first conference presentation and he was the only undergraduate student, with other presenters being professors, innovation practitioners or graduate students. Dr. Thomas is also engaged in discussions with Indian companies interested in exploring opportunities in Abbotsford. He has met with the senior management of these companies which would like to collaborate with UFV on research and student co-op opportunities.